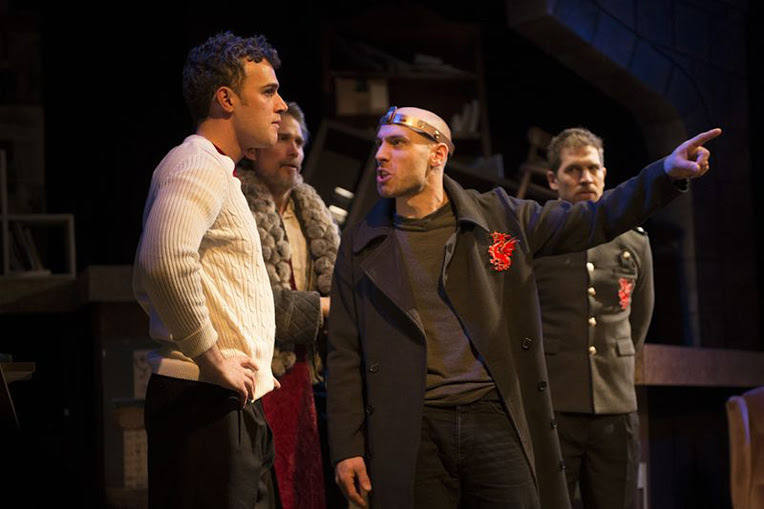 L-R: Jordan Kaplan, Eric Emil Oleson, Jacques Roy, and Tom Schwans inTHE TRAGEDY OF KING ARTHUR BY W. SHAKESPEARE. Photo by Debby Goldman. Arthur Phillips is a true polymath: a one-time child actor, a jazz musician, a speechwriter, a five-time Jeopardy! champion, and a highly creative novelist with several bestsellers to his credit. His fifth book, The Tragedy of Arthur, was published to critical acclaim in 2011 and has since been adapted for the stage by Phillips as The Tragedy of King Arthur by W. Shakespeare. The Guerrilla Shakespeare Project is now presenting the off off Broadway world premiere of the play at TBG Theatre on West 36th Street in midtown Manhattan. And it is a truly first-rate professional production, well worth seeing. Book 2 – the last 111 pages – was the text of the “Shakespeare” play itself, The Tragedy of Arthur, a five act play written primarily in blank verse. The plot for the play clearly was drawn from Holinshed’s Chronicles, Shakespeare’s primary historical source, and the play’s language was thoroughly consistent with Elizabethan language and grammar. So was The Tragedy of Arthur really a newly discovered play by the Bard of Avon or just another clever forgery by Phillips-2’s father? When Phillips-1 adapted his novel for the stage, he couldn’t very well write a play based only on the first 256 pages of his book (the “introduction”), stage that, and then stage a five act Elizabethan-style tragedy (the last 111 pages of his book) right after it. So he did something very much better: he created an intricate work that wove together the dynamics of modern father-son relationships, Arthurian legend, and outright fantasy, a work that incorporated a play within a play, and one that challenged its audience to question its very understanding of truth and reality itself. The protagonist of The Tragedy of King Arthur by W. Shakespeare is Arthur (that’s actually Arthur Phillips-2, played with extraordinary acrobatic athleticism by Jacques Roy). When he is bequeathed the manuscript of The Tragedy of Arthur, he is, to say the least, skeptical. His sister Dana (Sarah Hankins) is miffed that the manuscript has been left to him and not to her, but she is more willing to entertain the notion that it might actually be legitimate. Arthur’s agent (Geordie Broadwater), his lawyer (Jordan Kaplan) and a professor who presumably has vetted the manuscript (Tom Schwans) share Dana’s attitude, not Arthur’s. When Dana prevails upon Arthur that they act out the play themselves, in an attempt at determining whether or not it is a forgery, the characters morph into the very characters of Arthurian legend who they are depicting. Arthur, of course, becomes Prince Arthur – he who was to become the legendary King Arthur – but he is hardly the dashing character we’ve come to expect. Dana morphs into Mordred – Prince Arthur’s mortal enemy. And Arthur’s dead father (Eric Emil Oleson) appears in Arthur’s daydream or imagination or in some such fantastical form and, in the course of the play, becomes the Earl of Gloucester (who was a second father to Prince Arthur in earlier times). The entire cast performs brilliantly but three actors truly stand out. Jacques Roy is incredible as both Arthurs –Phillips-2 and Prince Arthur – bounding about the stage as a modern day Douglas Fairbanks and literally climbing the walls. Eric Emil Oleson is splendid as Phillips-2’s father in one scene and as the Earl of Gloucester, Prince Arthur’s virtual second father, in the next. And Geordie Broadwater is delightfully amusing both as Phillips-2’s agent and as an effete French diplomat exploring both the possibilities of a political alliance with Prince Arthur and more intimate liaisons of his own. John Duddy and Laoisa Sexton in FOR LOVE. Photo by Trevor Murphy. When Laoisa Sexton’s one act play For Love had its very short-lived world premiere at the 1st Irish Theatre Festival last September, it was named a “Pick of the Festival” by Irish Examiner. Cahir O’Doherty, reviewing it for Irish Central, called it “the strongest debut by an Irish writer I have ever seen.” Since I missed that opening (there were only four performances), I was delighted to learn that the play would enjoy a somewhat longer run at Irish Repertory Theatre on West 22nd Street in midtown New York this year (especially since I’m generally enamored of Irish theatre and I’ve long been a fan of the IRT). And so it was that I went to see a performance of For Love – and on the day of the St. Patrick’s Day Parade, to boot! My expectations were high. Sad to say, I was a wee bit disappointed. To be sure, the play is well written and well performed. But that is not enough. For Love is pointedly described as taking place in modern day Dublin during a period in which “Ireland is experiencing one of the greatest economic downturns in its history,” which led me to believe that I was about to experience something quintessentially Irish (what with it being the Irish Repertory Theatre and an Irish playwright and St. Patrick’s Day and all). But, in fact, once one cuts through the actors’ brogues and learns the Irish slang and references in the play (the program provides a fine “cheat sheet” for that purpose), there really isn’t anything particularly Irish about the play after all. Indeed, the tale of three thirty-something, love-deprived, and sexually frustrated women in Dublin – Val (Jo Kinsetta), Tina (Georgina McKevitt), and Bee (Laoisa Sexton, the playwright herself) – could have taken place in New York or Cleveland or almost any other place you might imagine (in good times or in bad), rather than during an economic downturn in Dublin, and nothing would have been lost. Bee, who had a love child when she was sixteen, is now on the verge of becoming a grandmother herself and is seeking to recapture her lost youth (even if it is with a married man). Her friend, Val, lacks even the solace of a child; her life has somehow slipped away from her and the likelihood of her ever having a husband and a family of her own (rather than a series of one night stands) seems to diminish daily. Tina is married but that doesn’t appear to matter; she seems to derive more pleasure from shopping and self-gratification than from her marriage. And although all three women perform well, there’s nothing particularly Irish about any of it. The play calls for several male roles as well – Aidan, One Night Stand, Club Guys, Bartender – but the playwright has specified that they all be played by the same actor (in this production, he’s John Duddy) as if to underscore the fungibility of men. In one or another of those roles, it’s he who interacts with each of the women. It may be argued that what disappointed me most about the play – what I perceived as mundane and platitudinous events in ordinary lives that take place every day all over the world – was actually the play’s strength. That is, its depiction of unloved, sexually deprived women in economically depressed Dublin might be viewed as just the symbolic portrayal of a universal condition. 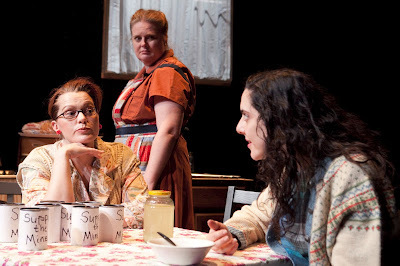 But even if one looks upon it that way, the play still fell short for me: what it still required was a more developed story line that would distinguish the lives of these three women from those of so many others. Lacking that, we still were left with little more than some good theatrical performances but with no real insights into the lives of the characters on stage. 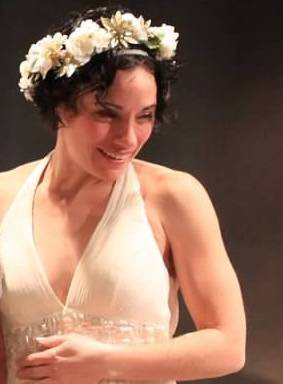 Kelli Holsopple in ELECTRA. Photo by Gerry Goodstein. 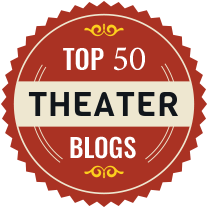 The Phoenix Theatre Ensemble, co-founded by Craig Smith and Elise Stone (who were formerly affiliated with the sorely-missed Jean Cocteau Repertory) is an exceptionally talented and professional off off Broadway troupe with a penchant for the classics. In 2011, Phoenix embarked upon a celebration of ancient Greek drama by commencing the staging of a House of Atreus trilogy of plays over a three year period - an ambitious project which is now culminating in the production of Electra at The Wild Project on East 3rd Street in the East Village. For its first work in 2011, Phoenix revived Euripides’ Iphigenia at Aulis. Helen, the wife of Menelaos, King of Sparta, had run off to Troy with Paris, a Trojan prince, and all of the leaders of Greece, including Agamemnon, Menelaos’ brother, joined in a war against Troy to retrieve her. Agamemnon was the commander of the Greek forces but the goddess Artemis has withheld the winds so that they are unable to sail for Troy. In exchange for allowing the Greek troops to sail, Artemis has demanded the sacrifice of Iphigenia, Agamemnon’s daughter. The play ends with Iphigenia being sacrificed and the Greeks setting sail for Troy. 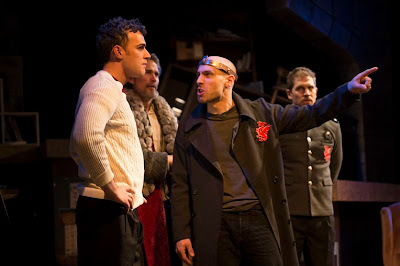 For its next work in 2012, Phoenix opted not to revive Aeschylus’ Agamemnon, but rather to launch the world premiere production of Agamemnon Home, a play by Glyn Maxwell that was based on the original tragedy by Aeschylus but took considerable liberties with it. It is a decade later and Agamemnon, no longer the heroic figure we’d come to expect, is returning home with his men. In his absence, Clytemnestra, his wife and Iphigenia’s mother, has hooked up with Aegisthus, Agamemnon’s cousin. After Agamemnon and Cassandra, his concubine and war prize, wash ashore, it only remains for Clytemnestra to resolve her relationship with Aegisthus and wreak vengeance on Agamemnon for having killed their daughter. The 2011 production of Iphigenia in Aulis, relying on a fine translation of Euripides tragedy, proved to be an excellent revival of a Greek classic. The 2012 production of Agamemnon Home, on the other hand, was not a revival per se but rather was a re-working of the original Aeschylus theme. As one who generally prefers not to see the classics tinkered with, I preferred the Iphigenia in Aulis production but I must admit that Agamemnon Home was still so good in its own right that I certainly enjoyed that one as well. Now, for its third and final production in the trilogy, Phoenix has again staged a revival of an original Greek tragedy – this time Sophocles’ Electra in the translation by Anne Carson. We have now come full circle: Agamemnon sacrificed Iphigenia in Iphigenia in Aulis, Clytemnestra avenged Iphigenia’s death by killing Agamemnon in Agamemnon Home, and now, in Electra, it only remains for one or more of Agamemnon’s and Clytemnestra’s children – Electra (Kelli Holsopple), Chrysothemis (Morgan Rosse), and/or Orestes (Josh Tyson) – to avenge Agamemnon’s death by killing their mother, Clytemnestra (Page Clements). Electra is consumed with the desire to avenge her father’s death by matricide but, as a woman, her opportunities to achieve her objective are limited. Her sister, Chrysothemis, shares Electra’s goal but is not nearly as obsessed by it as Electra is. And so the sisters hopefully await the return of their exiled brother, Orestes, who should be capable of accomplishing their goal. Orestes ultimately does arrive and the deed is done. Unfortunately (since this is the only one of the three plays still running), I found Electra to be the least satisfying of the three. Running time for the show is listed at 90 minutes but the performance I attended ran closer to 110 minutes and much of the excess I thought derived from unnecessary repetitive verbosity in the initial scenes. Amy Wagner directed all three plays and Kelli Holsopple is a truly fine actress (she played Iphigenia in Iphigenia in Aulis and Cassandra in Agamemnon Home) and Ms Wagner and Ms Holsopple teamed up to do a fine job on the first two-thirds of this trilogy but, for what it’s worth, I think they went off the rails a bit on this one. In Electra, I found Ms Holsopple’s performance to be excessively histrionic; indeed, she almost literally bounces off the walls. But all things are relative and. as a whole, the Phoenix Theatre Ensemble is so professional a troupe that even this lesser production is still worth seeing. Ms. Clements, in particular, does a fine job in her portrayal of Clytemnestra and Joseph J. Menino is delightful as Pedagogus, Orestes’ servant, former tutor, and traveling companion. 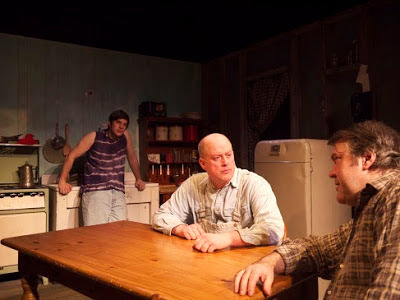 L-R: Alex Fast, William Laney and Brad Fryman in THE DRAWER BOY. Photo by Alexander Dinelaris. Although many New Yorkers never even heard of the play (I hadn’t myself until just last week), it actually was the fourth most produced play in the United States in the first decade of this century (according to the Wall Street Journal). Despite that broad national popularity, the play, which debuted in Canada fourteen years ago, has never been produced in New York - on or off Broadway – until now. The Drawer Boy finally has come to New York, in a terrific production by The Oberon Theatre Ensemble at the June Havoc Theatre in the Abingdon Theatre Arts Complex on West 36th Street. And now that it is here, it really is not to be missed. I don’t know why it took so long to get here, but now that it has, I’d urge you to make every effort to see it. Morgan and Angus have been friends since childhood. Canadian schoolmates, they subsequently went off together to Europe to fight in World War II, where they met, and fell in love with Frances and Sally, two tall British girls. Angus suffered a head injury during the war which affected his short term memory but Frances and Sally so loved Morgan and Angus in return that, despite Angus’ injury, they accompanied the boys back to Canada after the war so that the four of them might embark on new lives together. But it didn‘t quite work out like that. The play takes place in 1972 – forty years after the war – on a farm in central Ontario. Morgan and Angus are farming the land, tending the chickens, milking the cows. But Frances and Sally are nowhere to be seen. As Morgan tells and re-tells the story to Angus, Frances and Sally died years ago in a tragic accident. Or did they? And then Miles (Alex Fast), a young actor eager to research the lives of real farmers as background for his play, shows up. And as he delves deeper into the two farmers’ lives, unexpected truths emerge. The lines between theatre and real life, between what one is told or what one remembers or what one wants to remember and what really happened increasingly are blurred. And the stories that Morgan tells Angus take on a life of their own. William Laney is extraordinary in the role of Angus, whose personality shifts from that of a mathematical idiot savant to that of a mentally challenged man who cannot recall from one moment to the next to whom he is speaking, who is submissively obedient to Morgan in one instant and angrily flailing out against what he can neither remember nor comprehend in the next. Brad Fryman is equally impressive as Morgan, lovingly concerned for Angus who is as much his ward as his friend and tortured by the memories he carries within him and cannot share. And Alex Fast is splendid as Miles, serious and conscientious in his craft but at the same time bumbling and incompetent. All in all, a fine play with three wonderful performances. Go see it.